Naja Conrad-Hansen is an artist and designer working out of Copenhagen, Denmark. She was raised in an artistic family setting and graduated from Denmark's Design School with a MA in Visual Communication and Fine Art. She has found success as a freelance artist and designer whose practice embraces art direction, illustration, painting, graphic design, and even silk-screen printmaking. Her works have been included in a wide variety of fashion and graphic magazines and books. She also creates print and pattern designs for various clothing labels including limited edition prints for her own brand Meannorth. The artist was selected for "200 Best Illustrators Worldwide" 2007/2008 and again in 2009/20010, by Lürzer's Archive. The artist has four original works featured in the Line of Style exhibit opening this Saturday, April 3. Over the next week, we will be spotlighting other contributors to the exhibit. Keep posted! Annie award-winning animator Nicolas Marlet has lent his unique talents to the new Dreamworks' release "How to Train Your Dragon" opening this weekend. The French animator has been a part of the studio for 15 years on a number of feature films including "Kung Fu Panda" on which he designed the full cast of characters. 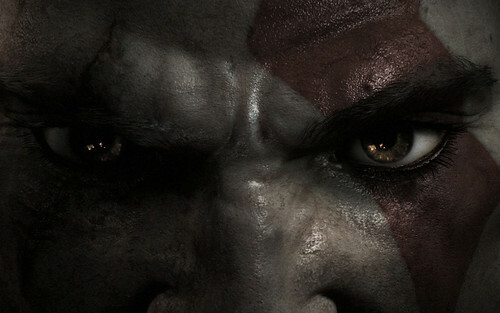 Oh My, God of War 3! No gamers or concept art fans should miss this Saturday'a GOW 3 event as we welcome the creative talents behind the PS3 game for an artist panel, book signing, and live painting demo. The evening will be jam packed with GOW raffle giveaways and artwork on exhibit. Admission is a mere $2 and with that comes a raffle ticket (for great prizes), plus $2.00 off any store purchase including the God of War III Signature Series Guide. It all goes down at 5PM! $2 Admission = 1 raffle ticket & $2 off any store purchase. 5PM -6PM: Panel and Q & A. Meet the artists and designers behind the game. 6PM: Book Signing for "Art of Book/Strategy Guide." 6PM-9PM: Witness the artists paint GOW themed artwork right before your eyes. Raffle drawings and giveaways of GOW merchandise every hour. Check out Electric Playground's coverage/interview of our Alice in Wonderland-inspired art show, Curiouser and Curiouser. If you weren't able to make the opening, you still have time to check out all of the incredible art! The show will come down on March 29. TOMORROW NIGHT (! ), right after the Alice Artist Panel, we're presenting works by two creative forces that will "awww" with their imagination and ingenuity. Jared Andrew Schorr creates works of light-hearted subject matter with the patience and precision of paper cuts. The kaleidoscope of colors and playful little monsters featured tomorrow night, will surely bring joy and and warm the hearts of many (promise, or your money back!). Check out some of Jared's works via his blog, where he also offers some very cool wallpaper downloads. Sean Chao sculpts and paints worlds filled of curiosity and amusement. His works stand as odd little moments frozen in time, where imagination and personal history intertwine and are delicately constructed with a gamut of mixed media. Come out and inquire into the natural wonder Sean's created for us, you'll leave longing for more. Visit Nucleus on March 13 for a rare opportunity to meet the creative talents behind the movie "Alice in Wonderland." The artists from Disney Studio will be joining our panel for a Q & A to discuss their work in Tim Burton's new film. Only Nucleus will be carrying the "Art of" book, "Alice in Wonderland: A Visual Companion" before its release date on March 30! Join us this Saturday and be the first to own the book and have it signed by the artists during this special, one-time only presentation! The Untold Want next Sat! We will be sharing more info as we approach the opening, but I hope you are marking it in your calendars because it would be great if you could stop by to see some really fun feel good art! Here | There features Edel Rodriguez who shares with us in this show, a rich narrative of his cultural background and experience from his homeland Cuba. In addition to the illustrative narrative that is presented to us through his paintings and sculptures, we are thrilled to be able to share with you candid, exclusive mini audios of Edel sharing with us the root of his inspiration for his many pieces. In a definitely unique experience, take a quick change of perspective to see the artwork from the viewpoint of the creator. His audios can be found throughout the online gallery of the show Here | There. Here is an example of such audios for your listening pleasure.